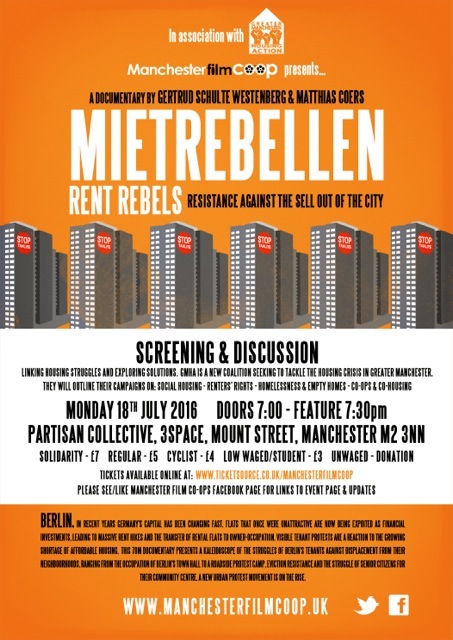 Manchester Film Co-operative and HomeMCR would like to invite you to a screening of the documentary film A Minority Pastime, narrated by Sir Patrick Stewart. On 18 February 2005, the Hunting Act came into enforcement – fox hunting was now illegal. Yet, Denise Ward (writer and producer) and other ordinary people who live in the apparently tranquil and idyllic countryside continue to find their lives barbarically disturbed and shattered by hounds in a frenzied chase of wild animals. A Minority Pastime is an on-the-ground documentary following the daily encounters between Hunts Masters, their groups and viewers, and those others who have something to say – countryside residents, hunt saboteurs and monitor groups. Denise’s investigations reveal an untold story behind this great British tradition, and raise poignant questions about the morality and, indeed, legality of this minority pastime. Time: Doors open at 18:10. Tickets: can be purchased from the HomeMCR website here. 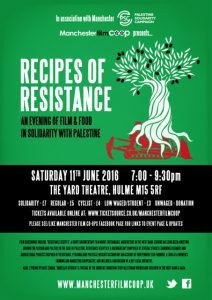 Manchester Film Co-operative and the Palestine Solidarity Campaign would like to invite you to Recipes of Resistance – An Evening of Palestinian Food Film & Solidarity. 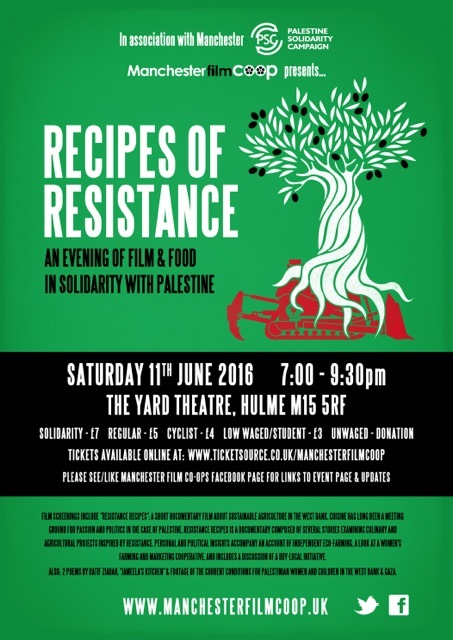 This fundraising event shall include the screening of a number of current documentary films on the Palestinian predicament, a cookery demonstration of Hummus & Fattoush followed & communal offering of Palestinian Food. 2 members of Manchester PSC will lead a Q&A session. Funds will also be raised through the sale of DVDs, Palestinian craft and produce. Any takings (after costs) from this fundraising event shall be donated to the PSC. “Resistance Recipes” – Official Selection at LONDON PALESTINE FILM FESTIVAL, BRISTOL PALESTINE FILM FESTIVAL, TORONTO PALESTINE FILM FESTIVAL and SHEFFIELD DOC VIDEOTHEQUE – is a 30-minute film (2013) by Dáša Raimanová, a London-based freelance filmmaker originating from Slovakia. Dasa graduated with a BA in Film, Video and Interactive Arts from Middlesex University. Her work explores socio-political topics, generally focussing on the stories of strong women. Her interest is in ordinary people with extra ordinary lives. “Resistance Recipes” is a short documentary film about sustainable agriculture in the West Bank. Cuisine has long been a meeting ground for passion and politics in the case of Palestine. Resistance Recipes is a documentary composed of several stories examining culinary and agricultural projects inspired by resistance. Personal and political insights accompany an account of independent eco-farming, a look at a women’s farming and marketing cooperative, and includes a discussion of a buy-local initiative. The screening of this film is part of a simultaneous screening event organised by Glasgow-based Camcorder Guerrillas & The Radical Film Network’s 2016 Unconference. 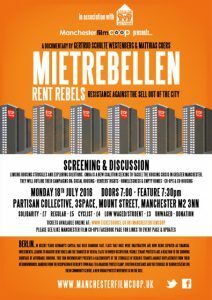 The aim of this UK-wide “simultaneous screening” event is to generate awareness and solidarity for Palestinian farmers and food producers in the ongoing Middle East conflict, as well as providing an opportunity to further develop the network of groups and organisations keen to use film as a tool to develop awareness and grow community cohesion around important social justice issues. As part of this “simultaneous screening” event , ten other screenings of Resistance Recipes have taken place at Liverpool Radical Film Festival, STEAM in Wigan, P21 Gallery in London, Lush – Oxford Street, London, DeCentre – London, Oban Community Cinema – Argyll, GreenCity – Glasgow, The Stove Network – Dumfries, Velocity Cafe – Inverness, Medway Palestinian Support Group – Medway. Other film screenings include: 2 poems by Ratif Ziadah, “Jameela’s Kitchen”(10m), footage of the current conditions for Palestinian women and Children in the West Bank & Gaza. Entry: Solidarity (optional) £7, Regular £5, Cyclist, £4. Student/low wage £3, Unwaged: donation. Pre-book: Tickets can also be purchased online here.